In the world of Windows, a desktop theme is a way to control many different aspects of your Windows environment. When you choose a desktop theme in Windows Vista, you can affect the desktop background, the colors of window title bars, shortcut icons, and cursors all in one quick adjustment. 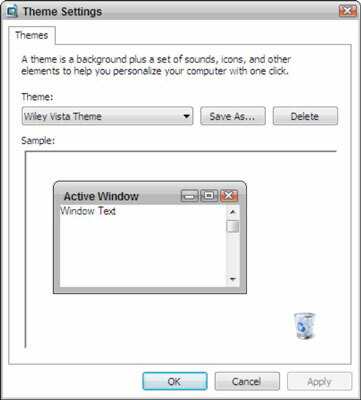 Themes save sets of elements that include menu appearance, background colors or patterns, screen savers, and even mouse cursors and sounds. If you modify any of these individually — for example, by changing the screen saver to another one — that change overrides the setting in the theme you last applied. Click the Theme link and select a theme from the Theme drop-down list. The Theme Settings dialog box. Windows Vista offers up a beautiful lake and mountains against a blue sky. The color scheme that this theme uses for various onscreen elements, such as window title bars, relies heavily on grays, blues, and reds. Windows Vista doesn’t come with a lot of themes for you to use, but if you buy and install Microsoft Plus! which provides you with lots of extra graphic goodies, the new themes are stored here by default. Windows Classic sports a plain blue background with silvery-blue and gray colors for screen elements. My Current Theme uses whatever settings you have and saves them with that name. Browse takes you to the Program Files folder of Windows, where you can look for any files with the .theme extension. If you find one you like, select it and click the Open button. You can save custom themes. Simply apply a theme, make any changes to it you like using the various Appearance and Personalization settings options, and then in the Theme Settings dialog box, click Save As. In the resulting dialog box, give your new theme a name and click Save. It will now appear on the Theme list. Click OK to apply the selected theme.